How will my Kringle gifts be shipped? We ship all of our gifts via UPS. We offer our flat rate two-day shipping, next day and priority next day shipping. We are also able to ship your gifts using your own UPS or FedEx shipping account, please contact customer service for assistance. Can I choose a future delivery date? Yes! You can order today and ship at a later date. After you put in your recipents shipping information, you can then select the arrival date on the calendar. Delivery dates are not guaranteed and may be affected by adverse weather conditions or UPS volume. Priority Overnight $49.95 per gift package. It will arrive the next business day typically by 10:30am. Shipping to Canada, Alaska, Hawaii and Puerto Rico $24.95 per gift package. Saturday Delivery may be available to select zip codes. We do our best to ensure your packages arrive on time, but we do not guarantee delivery dates due to inclement weather and the high-volume of packages in transit. What if the person is not home to accept the delivery? Most drivers will leave the package without a signature. Drivers will leave the package at a door they feel is used most often. If you have a package delivered to a residence, it is important to confirm the person is not on vacation. At times, the driver will not deliver to locations they deem unsafe. We suggest picking a location where you know someone will be available, for example, his/her workplace. We cannot provide refunds for deliveries where the recipient was not available. Unfortunately, no. We cannot deliver to PO boxes, at this time. UPS will deliver to physical addresses that the Postal Service will not, so ask your recipient for their physical address. We also recommend shipping to their place of work as an alternative. What if my shipment is delayed? UPS does their best to get packages delivered on time, but there are times when they are unable to provide on time delivery, such as bad weather conditions. We will do our best to work with UPS to get your products to you as soon as possible. Holidays can have delays due to high volume - during these times we recommend shipping for your Kringle to arrive before it is needed. We are able to change your order 72 hours prior to scheduled delivery date. This may vary during the holiday season. Can I place my order and have it shipped right away? We produce Kringles Monday through Friday, and typically ship Monday's, Tuesday's and Wednesday's to ensure same week arrival. If you order online, you can choose your delivery date from the calendar provided, but if you need it sooner, call our customer service for assistance. Why can't I ship on certain days of the week? 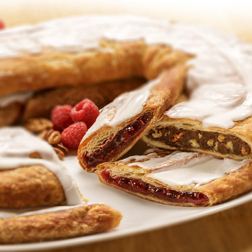 Kringle is a perishable bakery item, so it's important to get it to its destination to be enjoyed as soon as possible. We do not ship over weekends as it will cause the Kringle to be in transit longer and not arrive as fresh. When do I need to place my order to arrive by Christmas? We no longer can take orders to arrive by Christmas. Our next ship date is December 26th for Kringle delivery on the 28th.